Seoul is surrounded by mountains and it contains the Joseon Dynasty’s “Five Grand Palaces” – namely, Gyeongbokgung, Changdeokgung, Changgyeongung, Deoksugung, and Geyonghuigung. 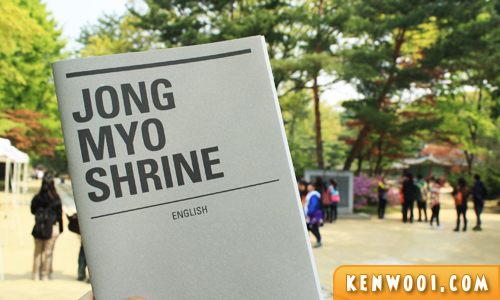 During our trip to Seoul, we visited the first 3 and Jongmyo Shrine – all in one day. It was sort of like a “Visit Palaces” day. All the palaces generally consist of prominent throne halls and several buildings within the vicinity. They are pretty impressive, especially the landscape and the historical architecture. 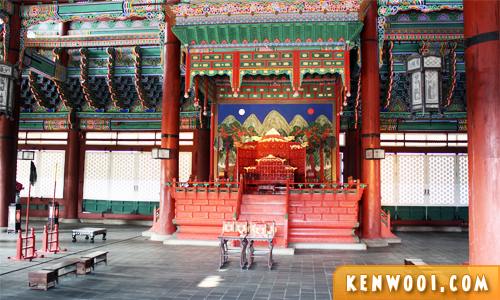 Our first visit wasn’t exactly a palace in Seoul – it’s actually a Royal Shrine, the Jongmyo Shrine. 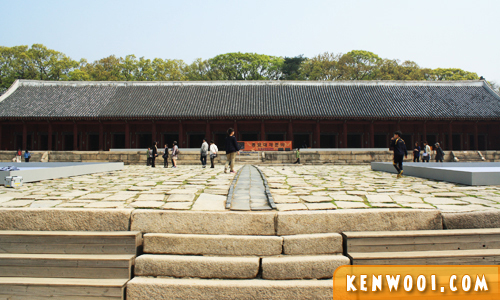 Jongmyo Shrine is a prominent place where the memorial tablets of Kings and Queens of the Joseon Dynasty are kept and honored. 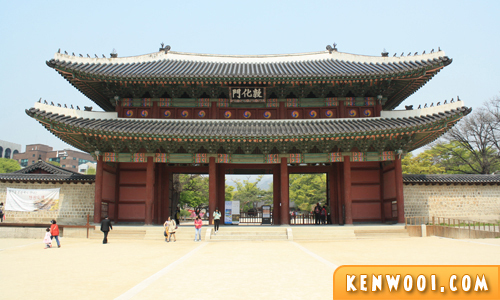 Travel Tip: To reach Jongmyo Shrine via the Seoul Subway – get off at Jongno-3(sam)-ga Station (Exit 11). 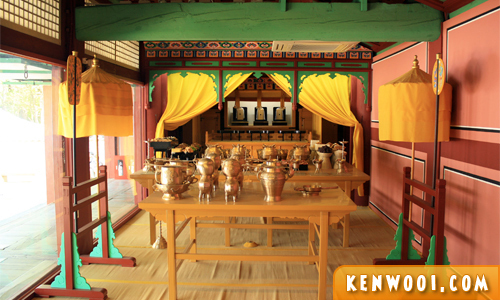 At present, two buildings within Jongmyo Shrine contains chambers that house spirit tablets. According to Confucian belief, spirits separate from bodies upon death, and the spirit goes to heaven while the body returns to earth. 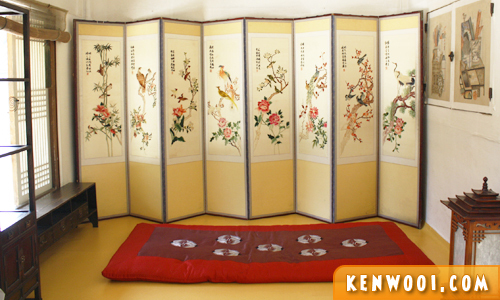 For that reason, Koreans built shrines to enshrine the spirit for worship. 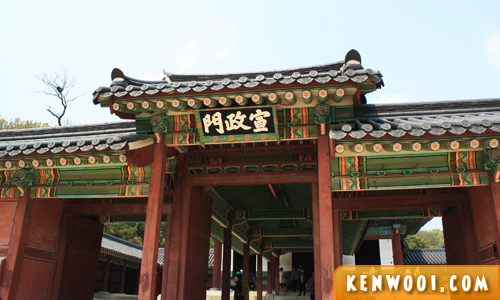 Since Korea preserves its royal shrine and continues to perform royal ancestral rituals, Jongmyo Shrine was designated as a World Cultural Heritage by UNESCO. 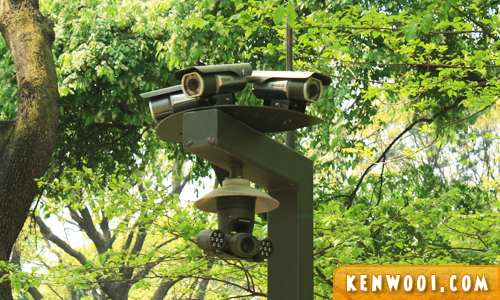 Look at that – cameras pointing at all angles – definitely to prevent any acts of vandalism and mischief. So high-tech… don’t play play! After Jongmyo Shrine, we proceeded north to Changdeokgung Palace. Changdeokgung was originally built as the secondary palace following the construction of Gyeongbokgung Palace. 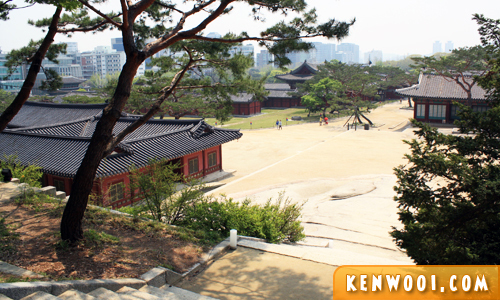 It’s known as the most well-preserved palace in Seoul with harmonized natural setting. Hence, it was added to the UNESCO World Heritage List. The admission fee to Changdeokgung Palace costs KRW3,000 (RM8.55) per adult, but we were fortunate enough that it was free on the day we visited. Changdeokgung Palace was constructed on the base of a mountain, so the buildings were built naturally to take into consideration the geographical features of the sloping surroundings. 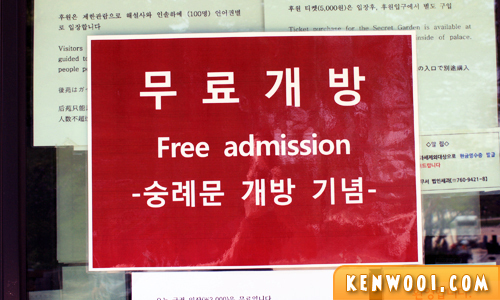 Besides that, guided tours are available in several languages – Korean, Japanese, Chinese and English. 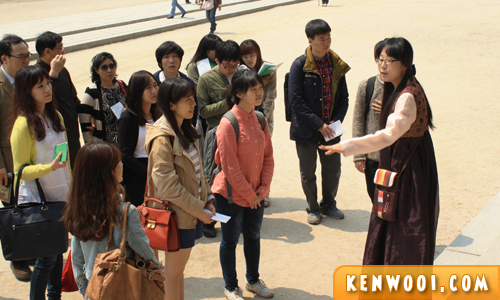 From what I observed, most of the people who joined the guided tours are Koreans themselves. It intrigues me that the locals are so interested in their own culture. By the way, there is an entrance at Changdeokgung leading to another palace called Changgyeonggung Palace. 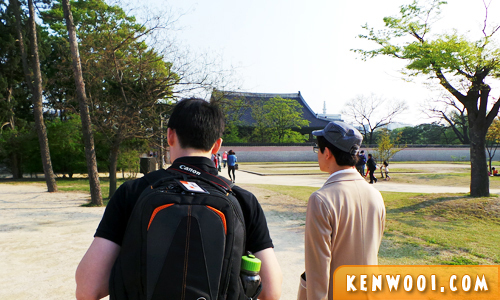 Without realizing it, we also covered Changgyeonggung although our initial destination was only Changdeokgung. Note: We didn’t intend to visit all the palaces in Seoul because they would be more or less the same. Anyway, the next and last palace we visited in Seoul is the famous Gyeongbokgung Palace! 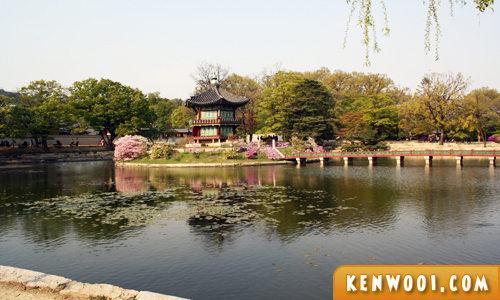 Travel Tip: To reach Gyeongbokgung Palace via the Seoul Subway – get off at Gyeongbokgung Station (Exit 5). Gyeongbokgung (means Palace Greatly Blessed by Heaven) is the main royal palace of the Joseon Dynasty where official ceremonies were held. It also served as the private quarters of the King and Queen. Fortunately again, the entrance to the palace was free! This time we found out that entrance to all palaces was free on that day in-conjunction with the completion of a gate restoration project. On a usual day, it costs KRW3,000 (RM8.55) per admission for adults. Another unexpected agenda was that we bumped into local students who were volunteering free tour services in Gyeongbokgung Palace. Since it was complimentary, and we’ll be able to get more knowledge, we accepted the offer. That’s Robin walking alongside me. He’s a high school student performing his community service. Here in Korea, students are strongly encouraged to do so. It was certainly a privilege to have Robin with us. He has such good hospitality! Robin showed us around the palace and explained historical stories and architectural features in English. 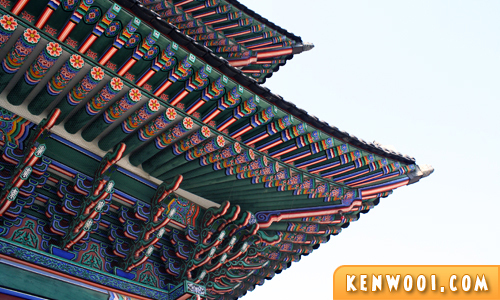 One of the myths and facts he shared was about the roof design of Gyeongbokgung Palace’s major halls. Factually, the multi-color paintings rafters illustrate the authority and dignity of the King. According to Robin, there is a myth relating to the red paint on the rafters – it is believed that it was made from human blood. Interesting. Besides that, the gardens are designed to preserve their natural state as much as possible, leading to a perfect harmony between nature and culture. This is a beautiful scene of a pavilion surrounded by a square pond located at the rear of the concubines’ quarters. Perhaps it’s the reason why this pond looks so feminine. Besides that, we dropped by the throne hall of Gyeongbukgung Palace. I bet most of you Korean drama enthusiasts would recognize the landscape painting behind the throne. It’s called “Irworobongdo” – the sun and moon symbolize the King and Queen, while the five peaks represent a mythical place. It looks all cozy and nice! And it doesn’t seem as stressful as the throne hall. Oh yeah, we also managed to see the Korean King with our very own eyes when we were there! How lucky was that, right? He looked very angry and was speaking really loud in Korean – which we didn’t understand at all. Oh well… Long live the King! But wait a minute, I should have gotten his autograph. Damn! ROFL! i love the last picture!! !